My Heart Talking Out Loud! : Who doesn't love Jollibee? 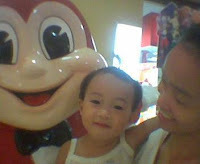 Do you know anybody, any kid for the matter-- who doesn't love Jollibee? Before I had Jada, I've been always wondering "why do kids love this big-eyed, wide-smiled character?" Now I know the reason... because he seems friendly, jolly and charming for kids. And for them, he looks cute and approachable! And now every time we passed by Jollibee's "house", it's a must that I have her get near him and touch him or else, she'll be very upset. That's the power of charm!